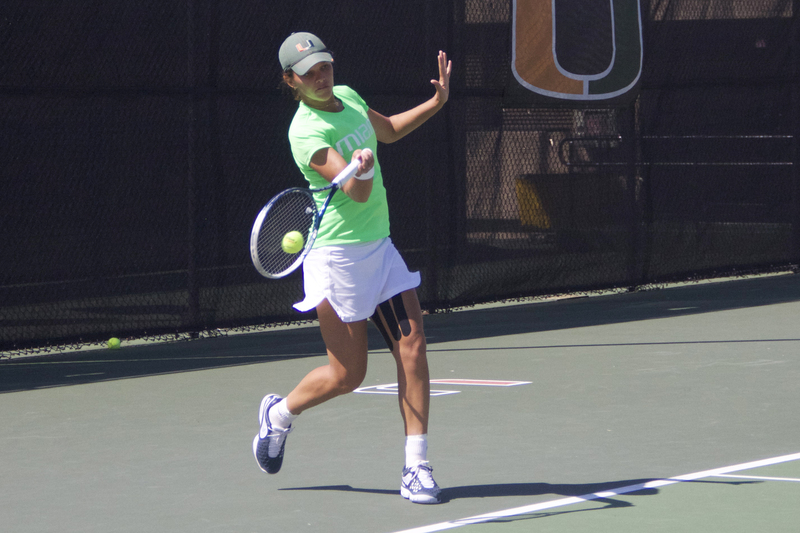 Miami had a big weekend as it extended a long winning streak against two ACC opponents. The No. 13 Hurricanes first took down Syracuse 7-0 at home on Friday, and then traveled to Winston-Salem, N.C., to face Wake Forest on Sunday. Miami won that battle easily, 6-1. The women’s team improved to 14-2 overall, with a perfect 8-0 conference record. They will carry their 10-match winning streak into an April 5 matchup with North Carolina. The Canes played arguably their best match of the season and earned a hard win over No. 18 Wake Forest on Saturday. Of note: Gabriel Flores cruised past Adam Lee 6-1, 6-0 and Omar Aly took care of No. 20 Romain Bogaerts 6-3, 7-6 (7-5) to secure the victory. Miami turned in a strong performance at the Hurricane Invitational, the first of three track and field meets at home this season. The Canes notched 11 wins on the second day of competition.